Virtual reality used to seem like something you MIGHT get to experience if you were lucky - but now...not so much the case! 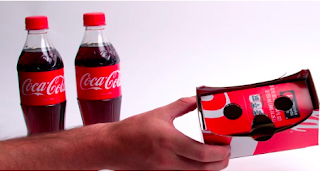 Someone much smarter than we has figured out how to turn a 12-pack Coca-Cola package into VR glasses. If Coke were smart, they would throw the lenses inside packages of the product and create an experience like only Coca-Cola can! We double dog dare you Coca-Cola! Do it!